Marco, a member of the MATE Group with Tessilmare, offer a selection of innovative feature packed pumps for all marine applications across water, oil and diesel fuel, including deck washing, water systems and bilge/submersible, shower kits, diesel and fuel transfer and transfer of viscous liquids. 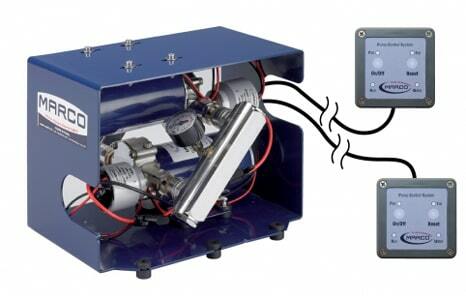 Marco pumps include electronic operation and remote control options. For water systems, self-priming automatic electric pumps with helical PTFE gears, integrated check valve and electronic control. Nickel-plated brass body and stainless steel shaft. Control panel available. 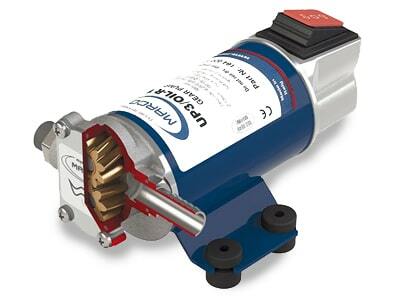 For bilge and salt water pumps, models include self-priming electric pump with flexible nitrile impeller. Now available in 3 different flow rates: 7.4, 9.2 and 11.9 gpm. Fitted with water proof cable guide and internal brush holder with EMI filter. ISO 8846 and ISO 8849. Ideal for bilge, waste water and ballast tank on any type of boat. For diesel transfer gear pumps Marco offer compact and professional self priming electric pumps with bronze gears for transferring of liquids. Pump body in nickelplated brass and stainless steel shaft. Main applications: transfer of diesel fuel and antifreeze. Electronic Diesel and Fuel Pumps in the Marco range offer variable speed operation, pumps are supplied with a High-Speed setting for Diesel transfer. They can interact with a SCS control panel allowing the switch to the Low-Speed mode for the transfer of oil and viscous liquids. For larger applications with higher transfer or output requirement, larger dual system pumps are available. Contact AMI for more information on Pumps suitable for your requirements. Marco also offer a selection of approved safety horns and hailers, including electronic, electro-magnetic, electro-pneumatic horns, including dual and single chromed style. Gas hand held horns also available including refills and accessories.